Some people who live in single-family homes resist anything other than single-family homes being built around them. But as our region grows, there will be a growing demand for townhomes and apartments. What if we just built them in disguise? The "Great House" near Tysons Corner. Photos by the author. Great Houses and "mansion apartments"
With its sweeping lanes and European-inspired houses, the Carrington neighborhood near Tysons Corner looks like any recently-built luxury home development. But there's something strange about the two houses at the end of the cul-de-sac. They look just like all of the others, except for one difference: each house has four mailboxes. This is the Great House, a four-unit townhouse designed to look like a large, single-family home. Like DC and Montgomery County, Fairfax requires developers to build affordable units in new developments, but they often stick out like a sore thumb. When Carrington was being built in 2001, the county worked with builder Edgemoore Homes to help subsidized, $120,000 townhomes blend in with homes several times as expensive. Each Great House is comparable in size to its neighbors and uses the same materials. But instead of one, 5,000 square-foot house, you have four, 1,200-square foot townhouses. Only one of the doors faces the street. A driveway runs around the back, where each townhouse has a two-car garage. This isn't a new idea, nor one limited to subsidized housing. The "mansion apartment building" has been a recurring concept in housing design for decades. Many of these buildings were built in the DC area around World War II, a period when there was a lot of demand for affordably-priced housing and very little supply. You can find them in a wide variety of places, from Chevy Chase to Damascus. The Great House could be a particularly useful housing type as the region grows. A recent study from George Mason University's Center for Regional Analysis estimates that the DC area will need 548,000 new homes over the next 20 years. About half of those units will need to go in the District, Montgomery, and Fairfax counties. And 60% of them will need to be townhouses or apartments. 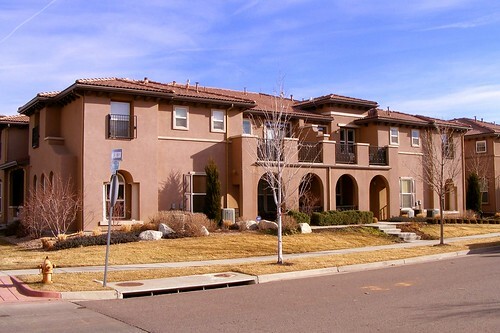 A recently-built "mansion apartment" in Denver's Stapleton neighborhood. Many of those homes can go in redeveloping commercial areas, like White Flint or Tysons Corner. But those areas won't be able to satisfy all of the demand and, besides, some people may not want a high-rise apartment. The Great House or "mansion apartment" offers a useful alternative. It also allows people who don't make six-figure incomes to live closer to transit or the region's job centers, meaning they're not driving on our congested roads. It opens up some of the region's most sought-after neighborhoods and the amenities they offer, like top-ranked schools. And it reduces the pressure to develop natural and agricultural land on the region's fringe. Those things don't really matter to neighbors who spend lots of time and effort to "maintain the integrity" of their single-family neighborhoods. But seeding their neighborhood with a few Great Houses that provide housing diversity while blending in could be a compelling alternative to building traditional apartments or townhouses there instead. Of course, they aren't possible under most zoning laws, which only allow single-family homes in "single-family neighborhoods." 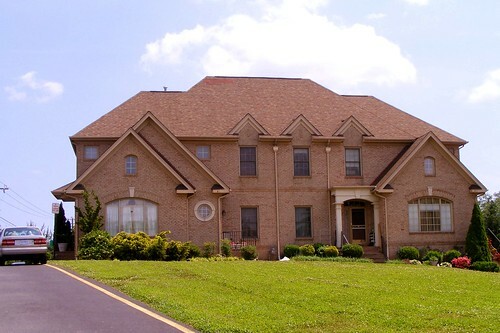 This housing type is also uniquely suited for large families. When my mother's family emigrated here from Guyana in the 1970's, her father (my grandfather) wanted a place that could fit his nine children, some of whom were grown and starting their own families. Grandfather passed up a big house on 16th Street NW for this mansion apartment building in Petworth, which had four apartments, each with their own entrances and kitchens, perfect for his adult children. Today, it's still in our family, though we rent some of the units out to other people. This type of housing is a sort of compromise between those who desperately need more housing options and those who don't want those housing options in their backyard. It's not the only solution to our housing needs, but it's definitely an important part of the toolbox. I'm pretty sure that I suggested this back in, oh I dunno, 2007 or so. Check back to that timeframe, pretty sure you'll see it.